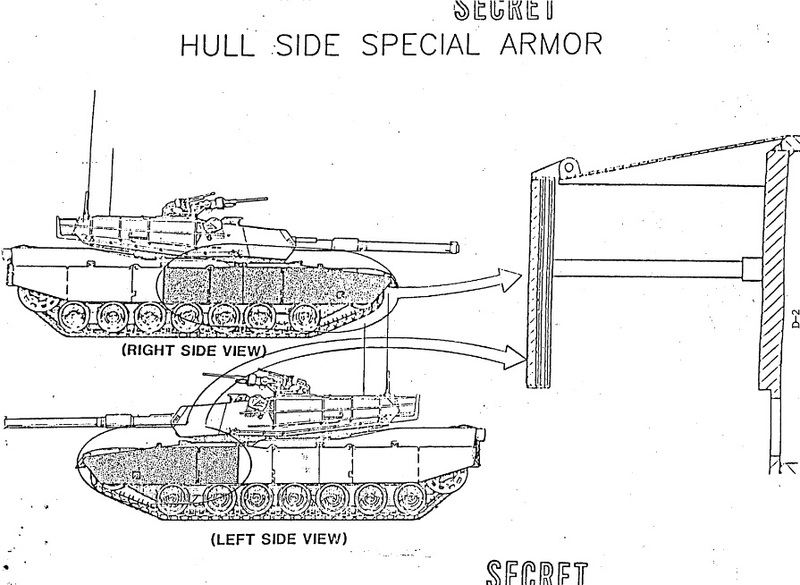 On the TankNet forums, a user with the nickname "whelm" has posted drawings from a formerly classified document on the earliest iteration of the US M1 Abrams main battle tank (MBT). He got this document from Vollketten, a user with accounts at the Sturgeon's House forum, the WoT forum and other places. 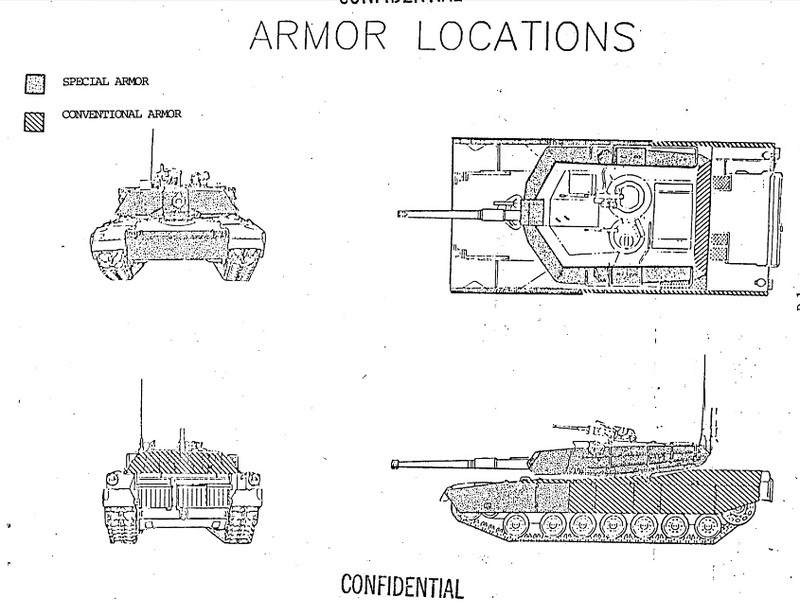 It details the armor layout of the tank, showing were the Burlington composite armor is located and how it is specifically implemented on different areas. Burlington special armor, also known as Chobham armor, is a type of composite armor developed in the United Kingdom by the FVRDE from the late 1960s onwards. It consists of a number of sandwich plates - also called biscuits - which are mounted in a spaced configuration. 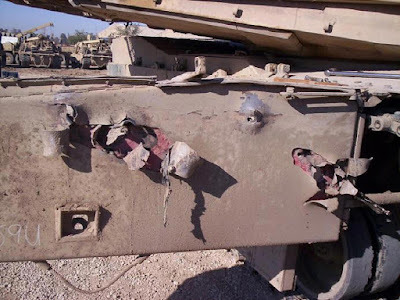 It is understood that these sandwich plates work as a type of non-explosive reactive armor (NERA), by using an elastic interlayer located between two metal plates (usually steel or alumininum). On impact the rubber will compress to the point of maximum compression, until expanding again and bouncing back. This will move more material into the path of penetration and also shatter thin and fragile projectiles, such as the shaped charge jets created by high-explosive anti-tank (HEAT) warheads commonly used on anti-tank guided missiles (ATGMs) and rocket-propelled grenades (RPGs). Essentially NERA works like explosive reactive armor, but with a lot less plate movment, as it only reuses the energy from the impacting projectile, instead of using an external energy source (such as the detonation of an explosive layer) to move the metal plates. 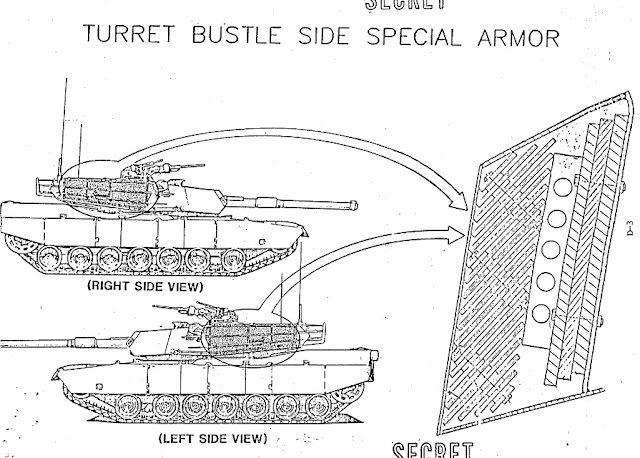 The special armor covers the frontal arc of the tank only, with an exception being the sides of the turret bustle. 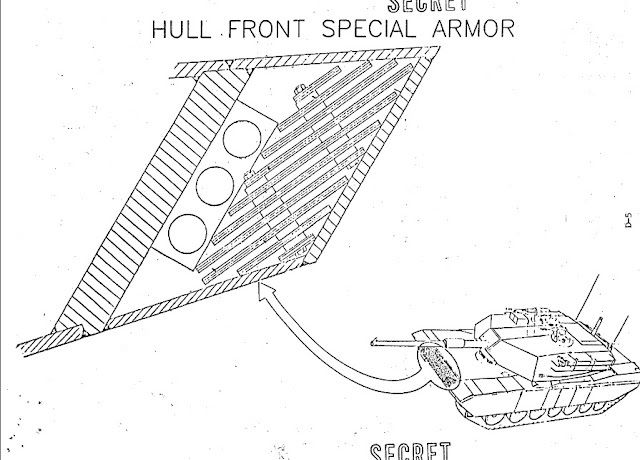 The lower front plate (LFP) of the hull is fitted with composite armor, the upper front plate, also known as glacis plate, however relies on conventional steel armor with high sloping. The gun shield and turret front, as well as complete turret side armor and the frontal two/four side skirt segments are protected by Burlington special armor aswell. The lower fornt plate of the M1 Abrams' hull consists of an array of NERA sandwich plates, which however only cover about half of the complete armor volume. The other half of the armor thickness is occupied by a mounting bracket for the NERA sandwich array and conventional steel armor. When hitting the hull straight on, the projectile has to pass through the exterior steel layer, four sandwich plates and then the thick inner steel plate. The special armor of the gun shield of the Abrams follows a similar design as the hull armor, however there is no mounting bracket. The gun shield itself also does only include a rather thin backplate, however there is a thick steel plate located behind the gun shield, which might be connected to the trunnion plate. When hitting the tank straight without any oblique angle, the penetrating projectile again has to pass through four sandwich plates. The side armor at the turret bustle seems to be the most interesting aspect of the tank, as it not only features a sloped NERA sandwich array and a mounting bracket as seen on the lower front plate armor array, but it also features a multi-layered backplate consisting of two steel plates with another material located between them. The exact naturre of this material is unkwnon, but it could be an application of ceramic as armor material. Using ceramic armor as part of the backplate in order to absorb the leftover penetration power of a projectile, that was damaged by (N)ERA sandwiches, has been suggested and patented by the Franco-German institute in Saint-Louis; it is believed that the armor used on the Leopard 2 and Leclerc might follow the same concept. However there is no exact proof that said material is ceramic; other possibilities include glass and silicia, which have been tested by the US Army's Ballistic Research Laboratory in the 1950s and 1960s as part of the siliceous cored armor for the T95 medium tank and the XM60 MBT. In theory the material also might be a type of glass-reinforced plastic or aluminium, as used on the early models of the Soviet T-64 and T-72 tanks. The sides skirts of the M1 Abrams consists of a four or five layer sandwich, which is spaced from the homogenous steel base hull armor. The outermost plate is apparently a steel plate, followed by what is believed to be alternating layers of elastic material and metal. On the left hull side only the frontal two skirt elements are fitted with special armor, which is required for protecting the crew and fuel tanks along the 60° arc (±30° from the tank's center line). 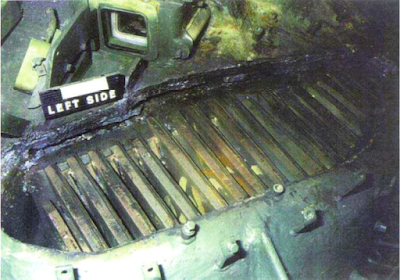 On the right hull side, the first four side skirt elements are made of special armor, which is required to also protect the hull ammunition storage that is located behind the turret ring at the right hull side. Unfortunately there is no image showing the frontal turret armor, but given that we know the layouts of the frontal hull armor, the gun shield armor array and the turret side armor, there is not much reason to doubt that the frontal turret armor will look a lot differently. In general the Burlington composite armor used on the M1 Abrams is a further evolution of the British designs from the 1960s and 1970s. 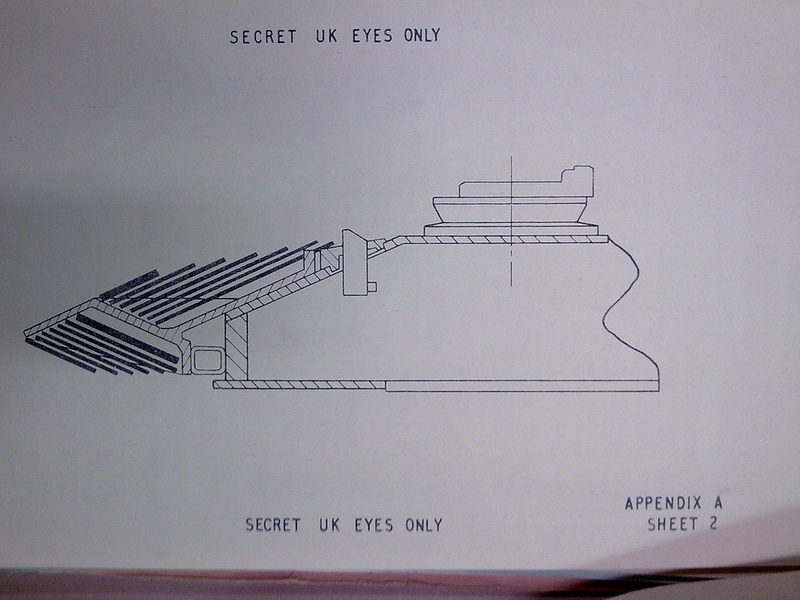 Thanks to nowadays declassified documents, it is a secured fact that the UK shared it's armor research with the United States and the Federal Rebuplic of Germany during the Cold War. 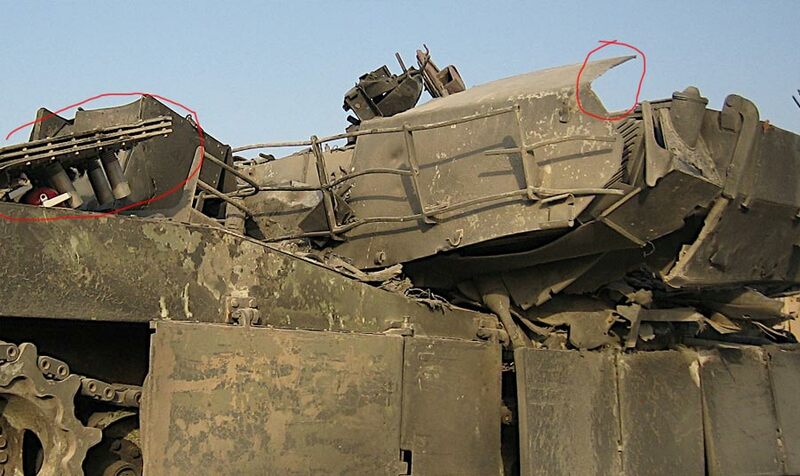 Thus we can expect the early armor arrays used on Leopard 2 and Challenger 1 to look very similar. Other countries have developed their own versions of NERA sandwich arrays in the past. 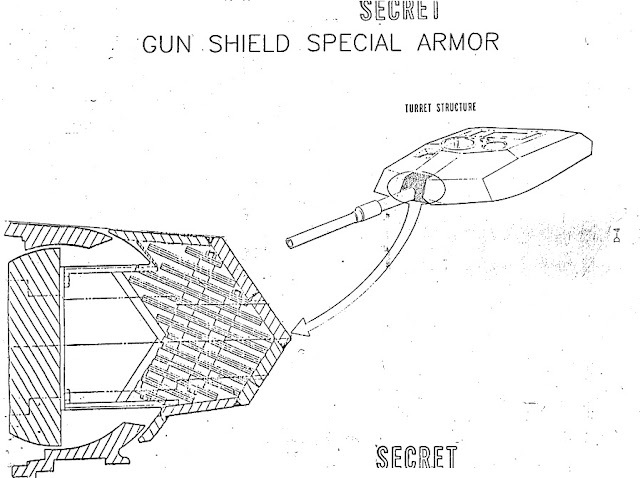 The Soviet Union adopted a very similar armor layout in 1985. Leaked Chinese armor arrays from research papers and CAD models show a very similar conception, using NERA sandwich arrays held by mounting brackets in front of thicker and multi-layered backplates. Photographs of damaged Merkava tanks reveal a similar armor concept/technology. More modern versions of the M1 Abrams and other tanks are still following this general armor design concept, however sometimes more complex arrays with additional layers and elements are used. A common design principle according to Dipl.-Ing. Rolf Hilmes, who formerly worked at the German BWB, and according to a presentation from the British Defence Science Technology Laboratory (DSTL), is to incorporate a further heavy layer in front of the armor array, which servers to disrupt (shatter/break) the projectile, before the fragments enter the NERA array. There are different options to implement this armor, however a common way is to use heavy ERA (such as the Kontakt-5 ERA and Relikt ERA used on Soviet/Russian MBTs) or thick NERA plates (as featured on the Leopard 2A5 and subsequent versions). Photographs from US Abrams tanks damaged in the Gulf War and in the Invasion of Iraq, show that in general the armor layout of the Abrams has not been altered drastically. Most likely the materials have been improved and the thicker back plates have been replaced by mutli-layered arrays including ceramics and other materials. A known addition to the side armor of the M1 Abrams' turret is at least a new spaced armor array, which is mounted on coil springs. The spaced armor is made up of three rather thin, multi-layered sandwhich plates. Most likely the coil springs are compressed, which would enable greater force being used against a penetrating projectile. A more detailed coverage of modern armor technology on this blog is planned for the future. Roof plate is angled upwards, when in reality it's angled downwards. Are those some doxxed fake documents, that were meant to be found by the kgb? The explanation is simpler: the person who scanned the document didn't line up the paper with the scanner. You can see how the words are also tilted, rather than being parallel to the lower and upper edges of the image. There currently is no reason to assume that these are fake documents. The distance between the L and the top plate is 24 pixels. Between the A and the top plate it's only 10 pixels. It's still angled upwards. Well it's just a schematic. Btw. 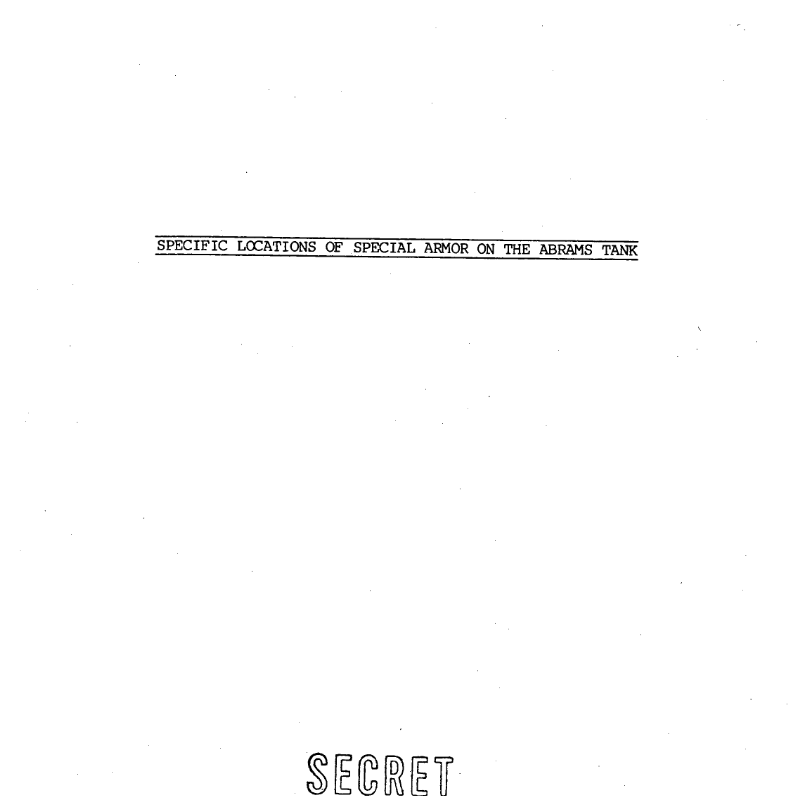 source of the images is an official document for internal work in the US Department of Defence. 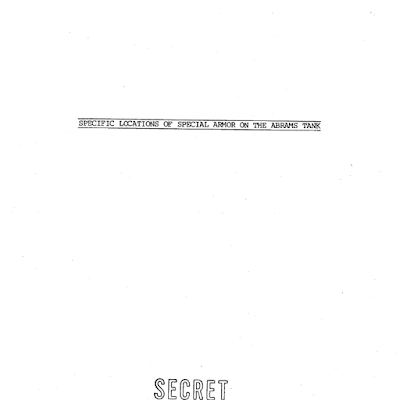 Yeah, it's declassified by the CIA. "Using ceramic armor as part of the backplate in order to absorb the leftover penetration power of a projectile, that was damaged by (N)ERA sandwiches, has been suggested and patented by the Franco-German institute in Saint-Louis." Imagine if this happened the other way round. Multi-billion $ law suit and a record fee. I'm extremely interested on the subject, have you got any estimated timeframe for the article? 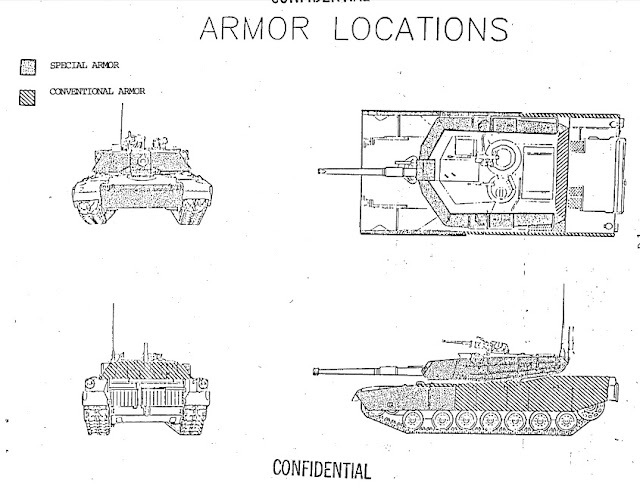 The document is from 1988, but specifically mentions that the armor scheme refers to the initial Abrams version from 1980.
and i'm waiting for the article that you hinted, I love your blog! very cool. i saw in nat geo how they overhaul the hull and thought, the heck? the lower hull is just conventional steel!. but this gave me relief.